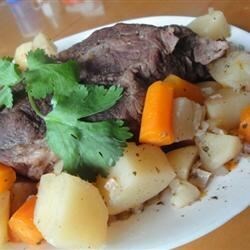 "Very easy, tasty pot roast. Uses things that even a kitchen novice can have in the kitchen!" Sprinkle the beef with seasoned salt and black pepper to taste. Heat the vegetable oil in a skillet over medium heat, and brown the roast on all sides, about 3 minutes per side. Place the browned roast into a slow cooker, and sprinkle the onion, chopped carrot, and celery over the meat. Scatter the potatoes and carrot pieces over the other ingredients, sprinkle on the Italian seasoning, parsley, and celery salt, and pour the can of soda over everything. Sprinkle the steak sauce on top. Cover, and cook on Low setting for 8 hours. So simple but really tasty! Wouldn't change a thing! LOVE LOVE LOVE it, we made it twice and both times turned out PERFECT and DELICIOUS!!! The cut of meat is from the Chuck, not the Sirloin. Ingredients could be confusing to some.